I am openly and unguardedly sharing my brain tumor experience, because we all have something which had, is, or will challenge us, and only positive things can be the outcome of sharing our experiences. If the reader has been recently diagnosed with a brain tumor, any other tumor, cancer, or life threatening illness, perhaps reading about my experience may give them a sense of support and strength, and some positivity, even laughter during a very trying time in their life, especially during recovery and “survivorship”. I welcome anyone to call me, and share whatever they would like. In the ( contact ) tab, you will find my contact information, especially my personal tel # ). I also welcome calls from family members, because it is often difficult for family members to understand exactly what is happening, because their family whom is going through the pre or post tumor experience may not disclose what they are truly feeling, as a result of being in shock, scared, or feeling to some degree that they do not want to burden family and friends. It is not just the patient who needs support. The following is the text from an article I wrote and was published in March 2011. I was happy to receive so many responses from people, thanking me for my positivity, which lifted their spirits. Surviving any traumatic experience is extremely challenging, especially a brain tumor. Any time of uncertainty needs true support from others, and I was happy to provide what I was able at that time, as I too was still in survivorship mode. The wonderful thing about life is "Tomorrow Never Knows" which is one of my two favorite Beatles songs. We have no idea of what tomorrow holds in store for us, especially what challenges it will bring. In the past 25 years, I have lived mostly in Italy, Paris, New York City and most recently in the Austrian Alps. I have been very blessed and fortunate to have experienced so much richness. Two weeks after returning from Austria to Chicago in October 2009, I experienced sudden hearing loss in my left ear. I thought nothing of it, but instead thought that nature will find its way to heal and correct the problem, and besides, it was probably due to returning to a stressful environment. Shortly after, balance issues surfaced along with twitching of several left facial nerves. I immediately went for an MRI of my brain, and the morning after I found myself meeting with a brain surgeon. After a few minutes of general questions, my surgeon brought me into another room where he had reviewed my MRI images. There was a single chair in front of a computer monitor. He did not ask me if I wanted to sit down, but stated "I think you better sit down." I looked at his eyes, which were glossed over, and knew the news was not good. I found myself staring at an MRI image of my brain: all the beautiful symmetrical gray areas. Perhaps it is because I am a curious designer, or simply in shock looking at my brain for the first time, but I was in awe of the obvious. I was staring at a round, white object—3.5-cm in diameter acoustic neuroma, pressing my brain, out of symmetry. I turned to my surgeon and said "this is not good?" There have been situations I have been in that were the results of my actions. One example was in January 2009 when I was skiing in Austria and was rescued off a steep headwall, tethered out by a helicopter. In such situations, you can only blame yourself for something you have caused. Staring at an image of your brain with a tumor is a humbling experience, because I truly realized how powerful, and beautiful nature is. Nature is unpredictable, and we cannot control it, nor should we. Nature must be respected, no matter what challenges it presents us. I tried to look at my tumor as an uninvited guest. I told myself that “I hope that the tumor has enjoyed its warm, soft environment for the 18 years or so it has been growing, because on January 29, 2010, I will be in surgery, and it will be evicted.” I was amazed at how my brain had absorbed my tumor, literally moving aside for it to grow. It is incredible how resilient and adapting our body can be. My other favorite song is "Across the Universe" by John Lennon/Beatles. Of course, the obvious way to interpret the lyrics in the song "nothing's gonna change my world," would be to feel that if you are confident, and believe in what you are doing, and you feel in control, then there is nothing to worry about. I have always felt that no matter how confident we are, how strong we may feel, how in control and in place everything may seem, we need to be thankful, because in a blink of an eye, that can all change. That is the beauty of life, and there is no escaping it. I have not escaped surgery without complications. There were only two months between my diagnosis and surgery, and being generally numb, I relied on my surgeon to inform me of surgery complications. Pre-surgery I was not even sure if I had tinnitus. If anything, it was extremely mild. My surgeon reassured me that post-surgery it would not be worse and may even go away completely. Post-surgery: even with an earplug in my right ear (good ear) every sound is excruciating. My right ear is overcompensating, and is hyper-sensitive. Every noise which enters is amplified in my left ear (deaf ear). I have what is called “hyperacusis,” which is an abnormal sensitivity to sound. I am reaching out and asking anyone for any helpful information. The psychological question I am having is who was I, and more importantly, who am I now? I have not sketched or designed since my surgery. Am I concerned? Is the reality that I should simply be thankful that my tumor was the reason I was able to create as I did? Whatever the answer is, I cannot dwell on the past, but only focus my energy on the present. I simply have to remain as patient as possible, and enjoy my current hiatus, no matter how long it may be. What I do realize is that I want to do something outside of myself. Not to design another product, or piece of furniture which will end up in another museum or receive another design award, but something which many people can benefit from. I am now focused on my non-profit foundation: a Brain Tumor and a Dream. In the past 18 months I have visited on three occasions, a special place in Sicily, Caltabellotta, a small town on the top of the mountain where the cluster of houses cascade down like flowing water. There is an amazing building which has unobstructed, breathtaking views of the entire valley, and the southern coast. It is this building that I want to restore into a Center for Inspiration.. I know first hand how difficult and disorientating “survivorship” can be. Even though our family and friends have been with us through our health challenge, we need our own independent time away, to reflect on our own, get our spirit back, and feel recharged. I am not here to plug my design in any way, but for those interested in design, design studies, living and working throughout Europe, please feel free to contact me with any questions. In the website: www.beachthingy.com you will see my latest invention I have brought to market, and under “designers" you will see my bio. I have tried to make my situation as positive as possible. We are here to help and inspire one another! The following is my MRI, and various photos related to my experience. This immediate film scene flashed through my head, because I did feel some fear of an abnormality related to my brain. I am so grateful to my friends and family or the support, and simply knowing that they were close to me. It was an intense experience for me to realize so many people were there for me, both physically and spiritually. Thank you to all whom spent the entire day in the waiting room, especially Al Destefano. Every prayer must have been heard. My dear friend Steven mentioned to me that when he was in surgery, he taped photos and inspirations to his leg. Having photos in a recovery room is just not enough, because who is to say that you will even make it to the recovery room. The photos and inspirations have to be with you, as part of you, during the surgery. Prior to surgery I created a collage of photos and told every nurse and my surgeons that I wanted the collage of photos to be taped to my left thigh, face down, so that the photos would be touching me the entire time of my surgery. This way everyone in the photos would be with me, pleasantly distracting me, each in their own special way. I feel it made a big difference, and did help me though surgery. I look t this collage from time to time, and realize how special everyone in it, are to me. It was so reassuring to wake up and see the photo composite taped to my leg. A second request I had, involved my teddy bear. 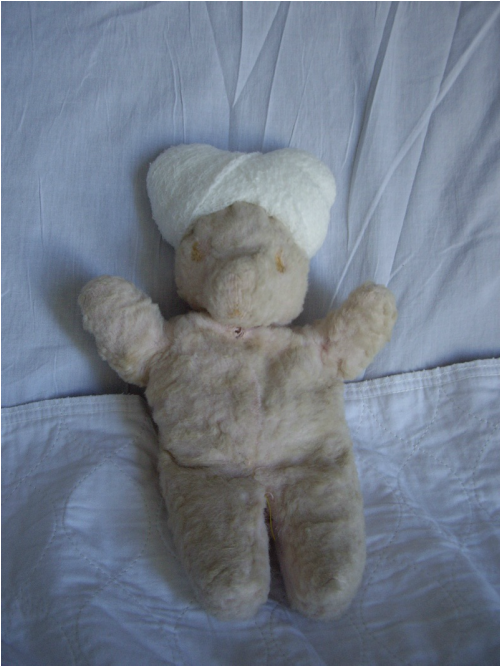 I was so adamant to have my teddy bear laying on the operating table with me, because my grandmother gave this to me when I was 4 years old, the only time prior which I was in a hospital, and I truly feel my grandmother has always looked over me and is my guardian angel. When my grandmother died, I placed it on her body during her wake, and even though I wanted it in her casket when she was buried, to watch over her, ( as it had done throughout my life ), I thought she would still want me to have it, to continue to watch over me, throughout the rest of my life. In all the places I have traveled and lived, I have always had it with me. When I was waking in the operating room after my surgery, I remember one surgeon held up my teddy bear and said “your bear says its’ time to wake up”. I remember sort of seeing that its head was bandaged, and when in the ICU recovery room, I was clear enough to notice that the surgeons ( or atleast one of the nurses ) took the time and care to wrap its head, as mine was. This was such an endearing detail. The day after surgery I was told I was doing incredibly well and they wanted me to go to a room down the hall, out of the ICU. A wheel chair was brought to my bed in the ICU and they asked me to get into it, in order to be wheeled down the hallway. I could barely stand, and when I did if I was to look down, I would have fell flat on my face due to balance problems. I mentioned that I understand they would like me in a wheelchair for liability reasons, but I will only get into a wheel chair when I am 90 years old, and I don’t consciously know what is transpiring. A nurse the entered the room with a walker for me, and a waist belt. After the belt was tightened around my waist, I took it off. I understood that the belt has so that a nurse could follow closely behind me, holding onto the belt so I would not loose my balance. This bothered me. I told the nurse I would be fine. There was one thing I was adamant with my family to make sure were in my ICU room, next to my bed, and that was my pair of Leki downhill poles. Perhaps it was a source of visual strength but it was wonderful to see them in my room. 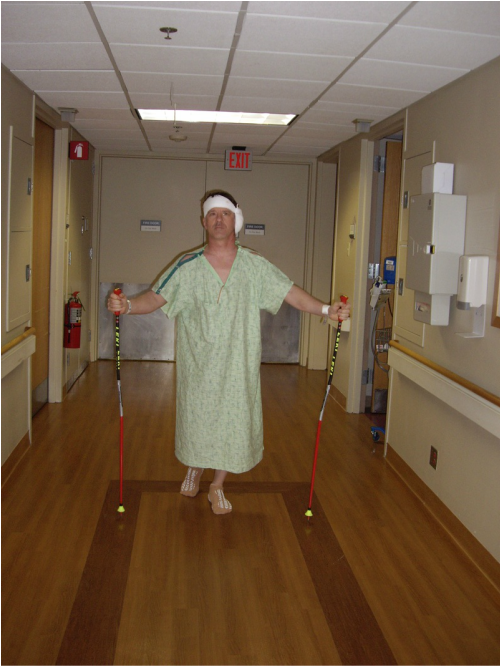 I asked the nurse for my ski poles and I began my walk down the hallway. Of all the photos taken during my hospital stay, I did not have anyone around a this particular moment. Which was fine, because this was MY moment. The contrast was fantastic: usually with downhill poles in my hands, I am racing down a slope, usually on the edge, with serious adrenaline pumping, and here I was with a nurse whom was walking very closely behind me as I was walking at a turtles pace. Believe me, I was extremely dizzy and severly off balance. I will always remember this moment, because I was walking step over step. The slowest person in a retirement home would have left me in their dust. For me this was one of the most exilerating moments in my life. I understood that my body and mind have just been through a very traumatic event and it will take time to get my balance back. Every step I was in tears, because I was embracing ever step, knowing that the next time I have these poles in my hand I will be once again racing down a slope. I am in awe when I look at this photo: It does not bother me to look at this photo, as when I was first staring at my MRI, because both are disturbingly beautiful, or beautifully disturbing. I was and am still in awe when I look at these images, because in nature beauty and destruction cohabitate. They are either holding hands ( or each other hands ) or right around the corner from the other. Sometimes subtly hiding with an occasional peaking out of their noses ) and sometimes far from subtle making their presence known. When one makes its presence known to the other, it can be overpowering, and all the other can do is step back, absorb any destructive forces ( and to destruction, beauty can be destructive ), and regroup. Even in nature there is a learning process. Both beauty and destruction have and always will find a way to cohabitate together, realizing their complete opposition to each other on the spectrum, but understanding that they need each other to survive, to be recognized. I laugh when I look at this photo: Pre-op my surgeon told me that he would be making a small incision behind my ear. For a moment I did feel like Royalty though, as if I was Prince Charles. My left ear was extended almost 90˚ from the side of my head. A nurse did confirm my thought: during surgery my ear was folded forward, if not laying directly on my cheek. If awake during surgery, I could have talked in my own ear. There is just enough “reflectiveness” in this, and not overpowering, even with the staples. In fact ( atleast I ) first see the contour of the face, move around to find a strange area of hair gone, then realize the staples are there. I like the subtlety, and the travel through the photograph. Most people prepare far in advance for a portrait: making sure their hair is perfect, their clothes are perfect...but I wanted purely a documentation, as raw as possible. This particular morning ( 5 days after surgery ) was the first time I had washed my hair. My hair and scalp felt discusting, hard packed with blood and brain fluid. After I gently washed my hair ( which during and after felt heavenly ), I asked my father to take a q-tip and warm water and clean up around the staples. He did not ask why, but I told him I was going to get a portrait taken. At that moment I decided to get a portrait. I called a photographer whom my parents had a Christmas portrait taken of all their grandchildren taken. I booked a time for later that afternoon. I paid for 30 minutes of camera and lighting time, and all I needed was the digital images for my use only. The photographer also agreed that he had no ownership, rights to publish or reproduce in any manner. I particularly like the red dot on my forehead. It is where a small screw secured my head in a restraining device during my surgery. 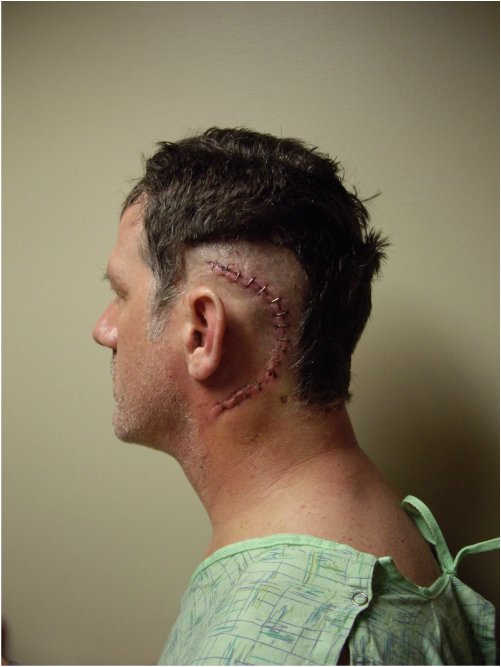 This portrait was taken 3 days before the staples were removed. As far as post-op senses returning to what they were prior, well, everyone is different. When things do “return”, they will most likely not be as on the same level as pre-op. For me, apr 1 ½ years post-op I seemed to have a metalish taste in my mouth, seemingly affecting my taste buds. I was concerned, because having an appreciative palette is one of the greatest pleasures, to enjoy food, and wine. After a hiatus of my taste buds, the seemed to return not to their former, but with a new explosion to live. It even appeared as if I was now able to taste even the most subtle ingredients. In fact something quite amazing has happened, which I do not even think for a second that it is strange, but I embrace it. My left eye tear duct ( the side of my tumor, and side my hearing is completely gone ) reacts to food. ex: Eating is even more pleasurable than pre-op, because my taste buds are exploding with pleasure. Most recently I had a meal cooked by a friend, and one tear arrived. They joked and said to me “you are crying because you do not like the meal?” I explained it and why, and then a few minutes later another tear arrived. A few minutes later a third tear arrived. I mentioned that I should be a food critique, and I rate by tear drops. I have quite a few one tear meals, also two tear meals, but this was a special three tear meal. I have had a 5 tear meal. My right eye tear duct reacts to emotion.